Posted on August 5, 2016 at 10:51 am. A recent video taken by tracker Eric of a male double-banded sandgrouse collecting and protecting his chicks. 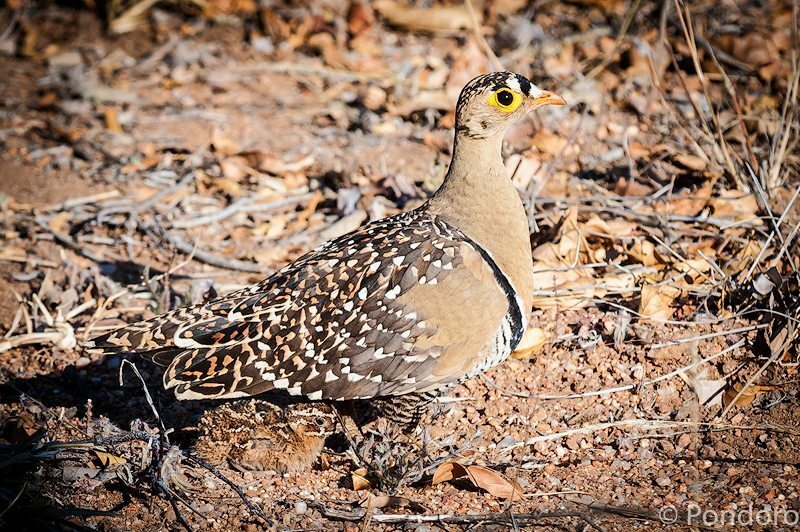 We saw a male and female double-banded sandgrouse sitting close to the road during an early morning safari drive. I then stopped the vehicle to give some more information about the birds and explain about some of their interesting habits while expecting them to fly off as usual. The female quickly skulked away while the male stayed, calling softly and slowly approaching our vehicle. This was unusual behavior and we quickly found the reason for this as soft peeps answered his urgent calls. Movement right next to the wheels attracted our attention and tiny shapes emerged from bare gravel, miraculously evolving into cryptically colored sandgrouse chicks. One by one the male collected these tiny bundles of chirping feathers and lead them away to a safe distance whereupon they all disappeared under the security of his wings and broad chest. We all know about a mother’s love and how protective they can be. Isn’t it nice to see that the paternal instinct in some creatures can be just as strong when witnessing this male boldly and fearlessly approaching a potential danger hundreds of times his own size to bring his offspring to safety? Sandgrouse nest on the ground. Male and female share the incubation duties with the male doing most of the work by day. Remarkably sandgrouse chicks feed on hard seeds right after hatching. They are the only birds to do so in Africa. The male sandgrouse helps in providing moisture to these thirsty chicks in an ingenious way. The feathers on his upper belly is modified for collecting and retaining water and he would wade into the shallows after his daily flight to the nearest waterhole to soak water into this spongelike feathers. These feathers can retain moisture for a flight of up to 40km far! The info you continue to submit extends our wonderful Pondoro experience.